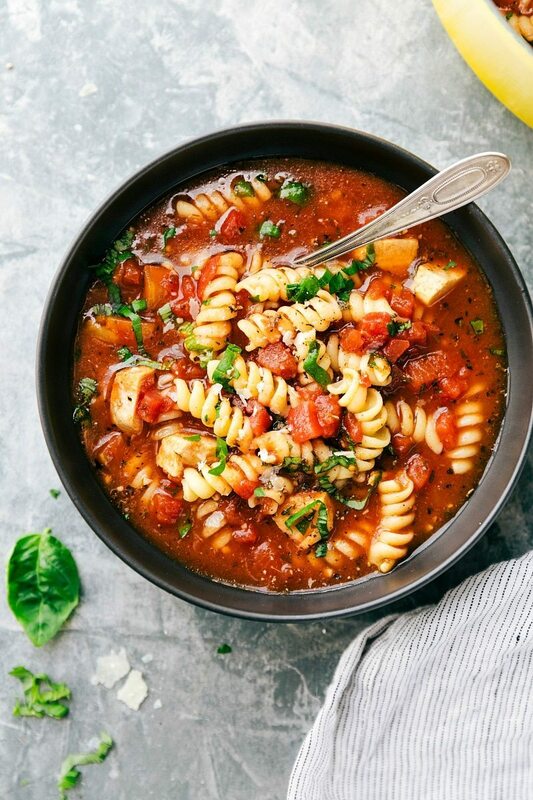 Twenty minutes TOTAL for this delicious, healthy, and easy chicken parmesan soup to be on your table! This is a soup the entire family will go nuts over! My toddler has never touched our Christmas tree. And to be honest I never understood when people would talk about their Christmas tree being ruined by a baby because my baby never got within two feet of it. Flash forward to my second little boy and in the first day it was decorated, I fully commiserated with those who’s babies destroyed their trees. The entire bottom 2 feet of the tree is bare, 3 new ornaments were shattered, at least 6 ornaments have been pulled apart, the cute fabric “Santa ornaments” now have some stains from being kissed with a not quite clean mouth, and the berry sprigs do not look anything like sprigs anymore. I can’t keep him away from it! There is always so much to do around the holidays (including redecorating the tree multiple times) which makes for busy and fun-filled days. Days that I don’t have all that much time to cook… That’s where this TWENTY MINUTE soup comes in. 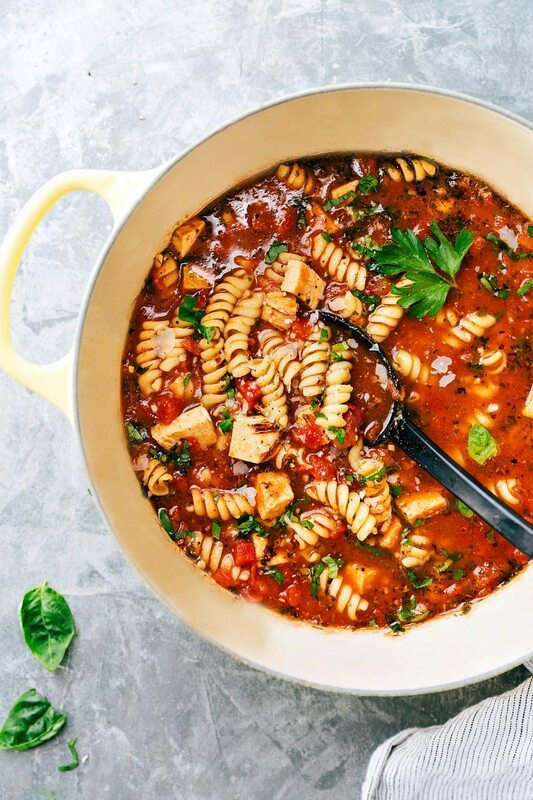 And I’m not even kidding — 20 minutes is all it takes to make this delicious chicken parmesan soup. Not only is this soup ridiculously easy, it’s also a huge crowd pleaser. With all the family and friends visiting around the holiday time, this is the perfect meal to whip up quickly. You’ll get rave reviews and not even have to spend much time in the kitchen! This soup has simple ingredients and extremely little veggie prep. The base is made up of Italian diced tomatoes and Swanson Organic Free-Range Chicken Cooking Stock. This stock has a super-rich flavor foundation that really enhances this soup’s flavor. Cooked pasta gets added to the soup and a prepared rotisserie chicken which is the real secret to how this soup is SO fast. Either use some of a leftover rotisserie chicken or grab some pre-shredded rotisserie chicken at the grocery store (<– one of my favorite time saving hacks and how to ensure this soup is ready in under 20 minutes). To finish off the soup it’s as easy as adding a generous handful of freshly shaved Parmesan cheese and chopped fresh basil! We liked this soup best with just the parmesan, but if you want a truer chicken parmesan in soup form, add in some freshly grated mozzarella. ?? Enjoy! 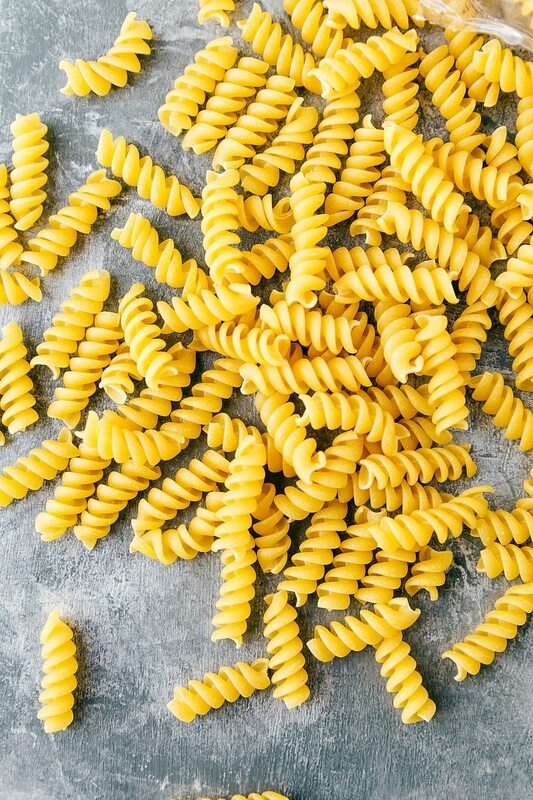 Follow package directions to cook the rotini pasta to al dente. Drain, rinse in cold water, and set aside. Meanwhile, dice the onion and mince the garlic. Place a large pot on the stovetop and turn to medium high heat. Add in the oil and onion. Sauté for a few minutes until tender. Add in the garlic and stir for about 30 seconds. Add in the tomato paste, undrained diced tomatoes, chicken stock, and seasonings (parsley, Italian seasoning, oregano, paprika, salt and pepper to taste (I do about 1/2 tsp. pepper and 1/4 tsp. salt). Mix and heat through and then bring to a simmer over medium heat. Stir in the prepared rotisserie chicken and heat through. Taste and adjust seasonings to preference (salt and pepper here again if desired and/or feel free to increase any amounts of those seasonings). This looks so good Chelsea! My family loves chicken parmesan! This would be a great change up 🙂 Thank you for sharing it! Sometimes Teddy is obsessed with the tree, and wants to pull everything off, and then sometimes it seems like he doesn’t even realize it’s there. Kids are so funny! 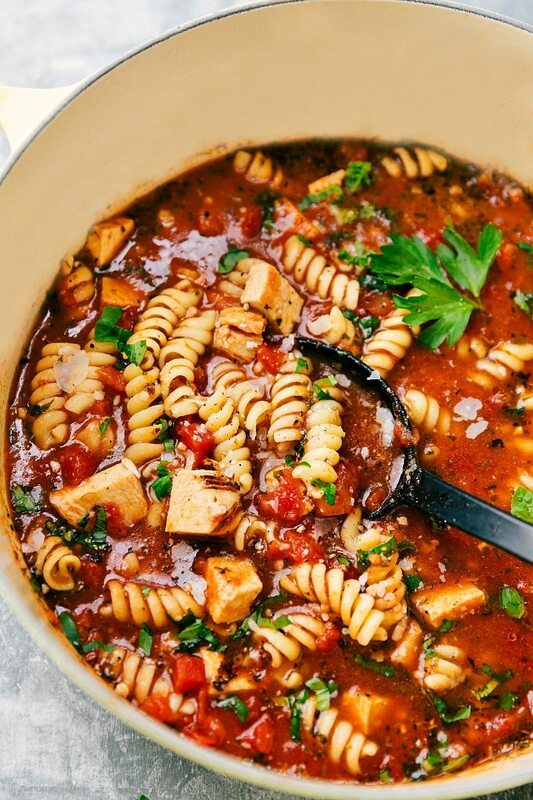 This soup looks SO delicious, and love how easy it is! Just made this as directed, except swapped out some dried basil for fresh, because that’s all I had. Delicious, as easy as advertised, and very filling. Thanks! Thanks so much for taking the time to comment Lara! 🙂 Thrilled you enjoyed this soup! Chelsea this was fantastic!! I added zucchini and used gluten free pasta!! Thanks for sharing!! Have a great day…. Do I have to use rotisserie chicken for the soup? You can do that and even with raw chicken. Just add about 3/4ths a pound raw chicken with all the other ingredients (minus cheese and pasta) and slow cook on high for 3-5 hours or low for 6-8 hours. Shred the chicken, add in cooked pasta, and garnish with cheeses 🙂 Enjoy! Oh- and the soup recipe looks like a winner! Oh my gosh!! How terrifying!!! I’m so glad your little guy was okay! This was a big hit from kid to adult at movie night at our place. Loved how easy it was to make and how easy it would be to add to for other tastes. I am a few years behind and just found Pinterest. I just stopped working and became a stay at home mom. This is the first thing that I have made and it was so easy. Thank you so much for sharing! I couldn’t find diced tomatoes but used sliced. It was chunky so my husband loved it!!! Cari, i’m soo glad you enjoyed this! I think sliced tomatoes would definitely be just as good! Hope you’re enjoying the stay at home life! I don’t think it would freeze great. This sounds and looks delicious! 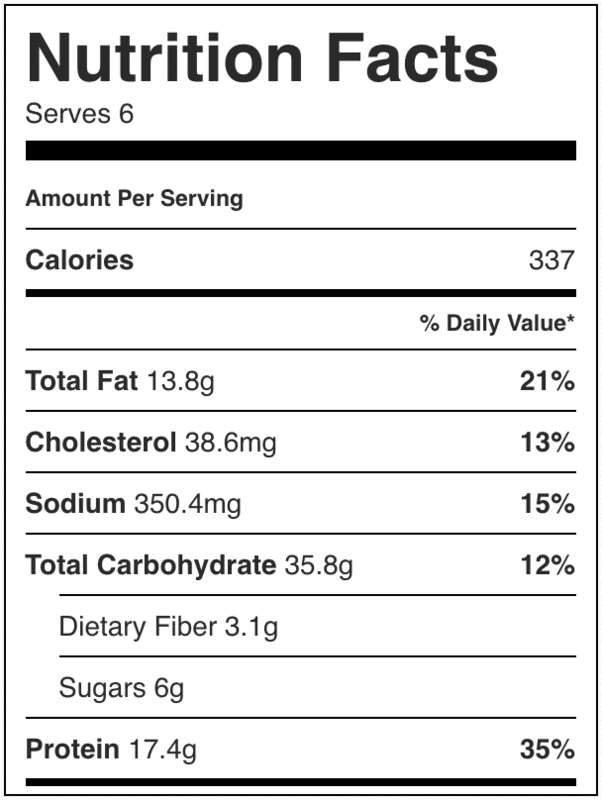 How much is a serving size? 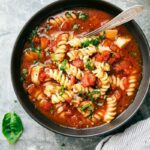 what can I use to replace the diced tomatoes in the recipe? I really liked this, but I adjusted a couple things. I pan seared chicken and then cooked the onion and garlic in it, I thought it added some good flavor to the soup. I also added a Parmesan rind and couple table spoons of tomato sauce to make it a little less watery. Some really good flavors!